Develop the Mental Strength of a Warrior! This e-book contains information for the fastest methods possible to tap into your inner strength and gain control of your life! Harnessing the untapped power of your mind is no longer a hidden mystery. There is a formula anyone can follow. This e-book contains information for the fastest methods possible to tap into your inner strength and gain control of your life! Harnessing the untapped power of your mind is no longer a hidden mystery. There is a formula anyone can follow – with remarkable results – and you’re just moments away from gaining access to it all! The power of your mind to accomplish more than you ever imagined is seen in a new light today – one that reveals proven steps to mastering your mind. Although the principles are as true today as they were a hundred years ago, our understanding of how the mind works – and how to benefit from it – has grown rapidly. A consensus is forming on how to put your mind to work so you can see dramatic results more quickly. Over the years, millions of people have been exposed to information that has helped them change just some aspect of their thinking and at only begin to move in a new direction. But that’s changing. So what’s different today? Until now, the information on how to create lasting change has been scattered, with only one or two aspects highlighted in each piece of literature or “method” being offered. Based upon numerous pioneers in the field of human potential, it’s the most comprehensive and to-the-point method I’ve ever found to help you finally understand and control the powers of your mind. When you develop deep personal mental strength and inner strength, your possibilities are limitless. Here is the truth at the core of this method: Each person is already wired for success - and it’s not that complicated learning how to use that ‘wiring’ to fulfill your own potential. Once you do that, you can contribute massively to the whole of humanity. At Warrior Mind Coaching and Training we believe passionately in human potential and the development of your own inner strength – and we’re on a mission to help you bring your strengths to the world! “Develop the Mental Strength of a Warrior” is devoted to teaching you the basics of the mind strength, inner strength and mental strength, so that you can discover and fulfill your potential. It’s designed to accommodate your busy schedule and your individual style of learning, because everyone’s different - and everyone has different goals. Each of us defines success in our own way. For some it means making a lot of money. For others it is winning a sporting championship or excelling at a vocation. Still others find success in raising a family, devoting themselves to a worthy cause, traveling the world or becoming an artist. Each of us decides what success is to us, and that is how it should be. • What would a joyful and meaningful life look like to you? • Would it be financial abundance? • How about spiritual enlightenment? • Maybe energetic and complete health? • Why not all of the above? 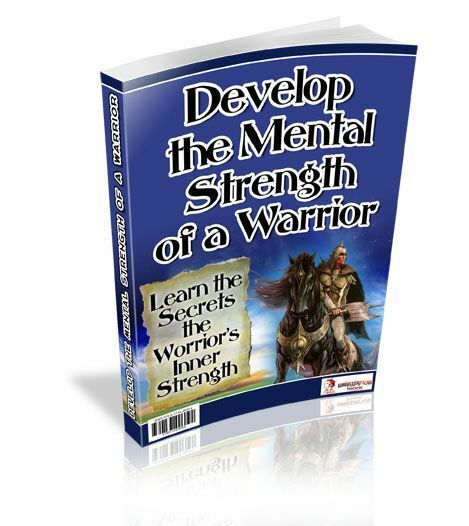 The mental strength tools and exercises in the comprehensive Warrior Mind Strength System will help you discover exactly how to activate the power of your mind. Whether you are a veteran who has researched this field on your own, or are just beginning to explore the untapped potential of your mind, this method will bring it all together for you in an easy to follow step by step process. “Develop the Mental Strength of a Warrior” information has always been reserved exclusively for our private clients participating in 1-on-1 Mental Skill Coaching or weekend intensive trainings. It serves as the foundation for the in-depth work we do with those that want to make powerful and lasting changes in their lives. So why am I making this information publicly available for the first time? It’s simple: Based on your own experience with the material, I want to you to truly believe that you really can control your thoughts and then your life. Once you “believe” I know that you may become intensely interested in gaining mastery over your mind and your life, and that’s what I specialize in...creating inner strength. Actually, introducing you to this powerful material is the best form of marketing I know. Once you understanding what you are really capable of accomplishing, you may want to come back and work with me deeper. Or like many others, you may begin to make dramatic changes in your life on your own, and start making improvements in your community as well. Either one is fine, because the world becomes a better place. There’s one other reason I’m releasing this system now. I’m gathering data to prove how effective the method truly is, and I’m receiving stories and feedback every week from people making dramatic improvements in their lives. But I don’t need to do that forever to prove my point. So once I sold 500 copies at $59.95 investment I am going to start charging $149.95. No, I’m not going to try and snow you with some hype about there being “only 12 copies left.” But if every 24 hours you find yourself getting one day older like I am, wouldn’t now be a good time to start to control your thoughts and improve your life? I’m so convinced that this method will work for you, as it has for hundreds of my clients, that I offer a satisfaction guarantee. If you follow this system exactly and you DO NOT begin to see measurable improvements in your own life, I will provide you with a free one-on-one coaching session to help you implement the system in your own life. It’s that good! Start today to change the way you think and your results will show…invest in “Develop the Mental Strength of a Warrior.” now!